EcoAir DD128 Review - Worth The 'Flagship' Title? This dehumidifier is currently unavailable. Instead we recommend the EcoAir DD122FW Classic, which has the same features but is a little cheaper. 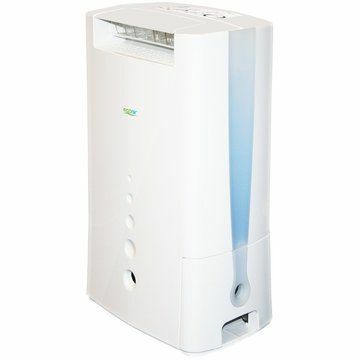 The EcoAir DD128 is described as EcoAir’s ‘flagship’ desiccant dehumidifier. This comes from the company that is currently dominating the desiccant dehumidifier market, so it certainly demanded our attention. The DD128 is essentially a beefed-up version of the extremely popular EcoAir DD122FW Classic, which we rated very highly, so this review will see whether the DD128 can match or even beat that rating. There’s no doubt the EcoAir DD128 is feature-packed and that’s evident from just one look at the control panel and it’s plethora of buttons. Don’t despair though, it’s very simple to operate and understand using the individual LED menus for each function. The first button is to switch on or off the ioniser. The ioniser will greatly purify the air by negatively charging allergenic air particles, causing them to become attracted to surfaces and one another, where they drop out of the air and can then be easily removed through normal cleaning practices. There’s also more anecdotal evidence that a more negatively charged atmosphere is beneficial for our general well-being (e.g. seaside air is highly negatively charged). Continuing on the air purification theme, the DD128 also comes with a silver-coated anti-bacterial dust filter. The silver coating on the dust filter kills bacteria and other allergens upon contact and is clearly a welcome addition to the machine. 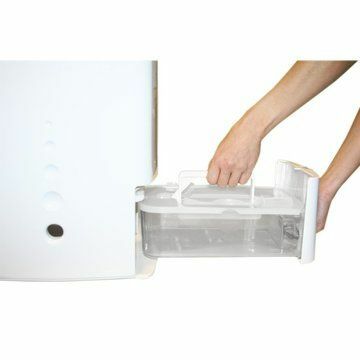 The filter is really easy to remove from the unit for giving it a clean with the vacuum. The next button is for the timer, with options for setting it for either two, four or eight hours. While this isn’t the best range of options available, it covers all the bases, and is very useful when combined with the laundry settings (we’ll talk about them soon) or if you don’t like to keep your dehumidifier switched on all of the time, keeping energy consumption to a minimum if you’re often not around to turn it off or generally a little forgetful like me. The ‘3-D louvre’ settings are controlled by the next button, a feature which is unique to EcoAir. The DD128 can vent air over a 150° range, and the machine will swing over this wide range continuously on the ‘wide’ setting. You can also choose to vent over a ‘front’ 50° angle or ‘up’, which will vent over the top 100°s. The swinging pattern can be disabled by holding down the button, which will hold whatever angle the louvre was at that particular point in time – this is ideal for targeting particular patches of mould. There are two ‘laundry’ settings, one is the ‘normal’ laundry setting, which EcoAir recommend for summertime drying, the other is the ‘turbo’ laundry setting, which is recommended for wintertime drying. Both laundry settings run the dehumidifying components continuously and will not stop dehumidifying no matter how dry the air gets, which does dry clothes or a particularly damp room much faster. Just remember that you shouldn’t overuse this setting as very dry air can be as bad as damp air and there is also a risk that you’ll damage the machine. EcoAir recommend that you don’t use these settings continuously for more than two or three days. Because clothes will only take two to four hours to dry under this setting, the timer settings can be useful to avoid ‘over-drying’ the air. While there are three dehumidifying settings, there are two humidity ranges that you can choose from, either 40% to 45% relative humidity or 50% to 60% relative humidity. This means that the DD128 offers less humidity variability than other dehumidifiers, although with the ‘ideal’ range for humidity being between 40%RH to 60%RH, arguably, coupled with the laundry settings, you shouldn’t need a wider range. In ‘economy’ mode the dehumidifier will target the 50% to 60%RH range and toggle into fan-only mode when the air is within the ideal range. I’d suggest that this would be the setting the you should leave the machine in for the majority of the time. ‘Hi’ setting targets 40% to 45%RH, switching to fan-only mode when the room falls within that range and is ideal for when the temperatures drop below 5°C outside, when a lower humidity is more comfortable. The third setting is ‘auto’. This setting, like ‘economy’ mode, targets the 50% to 60% RH range. The only difference is that when the machine senses that the room humidity has increased well-beyond the targeted range (e.g. after a hot shower, after cooking), it will kick in full dehumidifying power to reduce the humidity quickly, whereas in ‘economy’ mode it would reduce this more slowly to save energy. ‘Auto’ mode will use the ‘economy’ power by default when the humidity of the room is only slightly outside the targeted range. This ability to vary the dehumidifying power within the same ‘auto’ setting is EcoAir’s so-called ‘E7 technology’ and could be very useful in continually damp homes, where ‘economy’ dehumidifying setting feels underpowered some of the time. The final button on the control panel is simply the on/ off switch. You’ll also notice two lights in the top left corner; one is a warning light, which will illuminate if, for example, you haven’t cleaned the dust filter recently or the water collection bucket hasn’t been replaced correctly. The other illuminates when the water collection bucket is full – the DD128 does stop dehumidifying when this happens, so there’s no risk of overflows. The water collection bucket is slightly larger than usual with the DD128 being 2.2 litres, compared the the rest of the market where 2 litres seems to be the standard for this power of dehumidifier. The bucket slides out from the side of the unit for easy access and comes with a lid and handle to minimise the risk of spillages. There are viewing widows into the bucket on the front and side of the unit, so discovering the current water level isn’t a guessing game. As you’d expect, the machine can be set to continuous drain with the 1m length of hose that is supplied in the box. 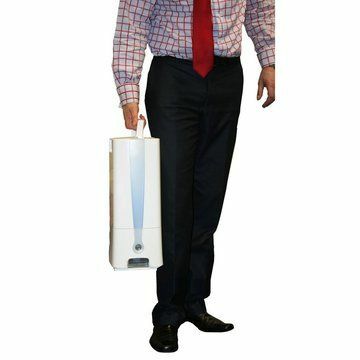 With the EcoAir DD128 being a desiccant dehumidifier, without the heavy compressor of a refrigerant model, you’d expect it to be light and at just 6.1kg, it is within a hair’s breath of being the lightest full-sized dehumidifier available. Being so light it’s a doddle to pick up and carry around and this is enhanced by the ergonomic, top-mounted carry handle. Its dimensions are larger than some desiccant dehumidifiers and we are guessing that this can be attributed to its greater extraction rate and larger water collection bucket. It measures 21.2cm deep by 47.6cm high by 32cm deep, which is still pretty tidy. EcoAir have made huge improvements with the look of the DD128 over earlier models and we like the curved design and matte white finish. It can sometimes be found in a range of colours including blue (our favourite), red (more like pink), green and black (grey), should you wish to match existing colours in your home. The design from a functionality perspective sets the standard going forward for domestic dehumidifiers. The noise the EcoAir DD128 produces emanates almost solely from the fans running within it. It is remarkably quiet, at only 35dB up to a maximum of 47dB when running on full power. 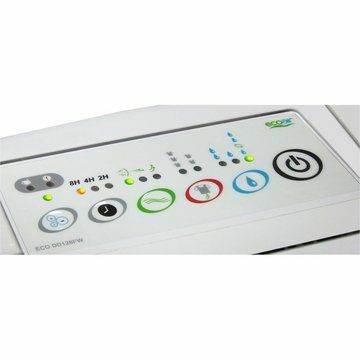 This is within just 1dB of the quietest mainstream dehumidifier available. It is so quiet in fact that I wouldn’t have a problem leaving it switched on in the room that television is being watched or in the bedroom, particularly as the noise that the fans produce is a very ‘white’ noise which blends into the background easily. As well as the design improvements, the EcoAir DD128 gets a power boost over the other EcoAir desiccant dehumidifiers, extracting up to a maximum of 8L per day as opposed to 7L. 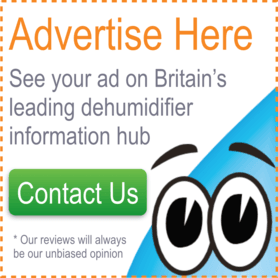 Remember when comparing these extraction rates to those of refrigerant dehumidifiers that can extract 12, 16 or even 20 litres per day that refrigerant dehumidifiers are tested in conditions that are never going to be found in UK homes (typically 30°C and 80%RH) and in fact the DD128 producing 8L per day (measured at 20°C and 60%RH) is most comparable to a 20L refrigerant dehumidifier. Remember also that this model will keep on performing down to just 1°C, conditions where other dehumidifiers just cannot function. So this model is a great choice for a cold house or a shed, boat or caravan. 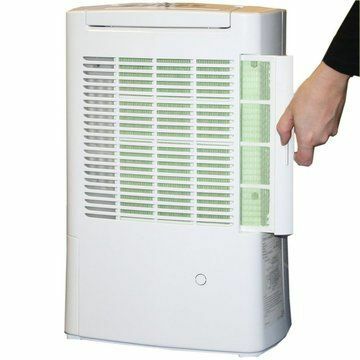 This dehumidifier should be capable of regulating the humidity of any space up to a 4 to 5 bedroom house. 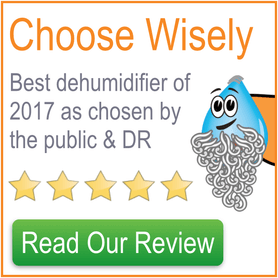 The EcoAir DD128 takes the most popular dehumidifier on the market and improves on both the design and extraction rate; it’s a winning formula in our opinion. With a two-year warranty the only remaining hurdle would be the price. Thankfully, we’ve found that at this shop, it can be had for almost the same price as it’s less-impressive but more popular sister model, so check it out!